The Red Herring is a non-profit lunch-only vegan restaurant that is literally across the street from the Anthropology Department. You would think because 1) it is so close to where I work –and- 2) I’ve been a vegetarian and/or vegan for the past 11+ years, that I would be eating lunch there all the time. But not so much really. Before the last week, I’d probably only eaten there 3 or 4 times. This is because I’ve never been much of a lunch person, but that is probably beyond the scope of this blog. At any rate, I found out recently that the Red Herring is in financial distress and in imminent danger of closing forever. In a grass roots effort to keep their doors open, they’ve been trying to get everybody and anybody to come in and buy lunch. I guess they normally serve maybe 50 people a day, and they need to drastically increase that number in order to make enough money to buy the supplies to stay open another week. (Keeping in mind that the people who work there are volunteers and do not actually get paid). Rob and I met for lunch there last Friday, and it was a little chaotic. There were a lot of people in there, and you could tell that the staff was not used to this kind of business. This week, I scored some office space in the department, so I’ve been working from campus and have been back to the Red Herring twice to pick up a sandwich to go. Both times there have again been tons of people ordering lunch. So much, in fact, that today I waited in line for 30 minutes before even placing my order. Just as I got up to the counter, they announced that they were out of everything on the menu, except the Baked Tofu Sandwich—which was actually the thing I wanted anyway, so that was fine by me. 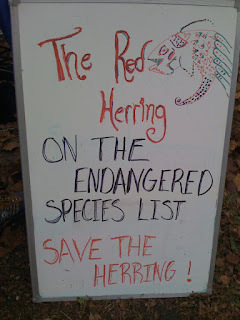 At any rate, I really, sincerely hope that the Red Herring doesn’t have to close down. Its been open for the past 30 years, and I guess its the only totally vegan restaurant in town. Restaurants normally stress me out, because I usually have to ask about a billion questions to determine what, if anything, is vegan and even then I’m never quite sure. So it is really nice to have this restaurant that is all vegan, and I can order anything off the menu (provided that they don’t run out). If you live in the Champaign-Urbana area, please drop by the Red Herring for lunch in the next couple of days to help support a local business. Its in the basement of the Channing Murray Foundation, at the corner of Mathews and Oregon. The Channing Murray is some kind of Unitarian church, but I don't think that the restaurant is affiliated with the church. Anyway, the food is amazing, and I’m not just saying that because I’m vegan. SL took us there for a Dissertation Lunch one time—even he enjoyed it, and he’s a total carnivore. 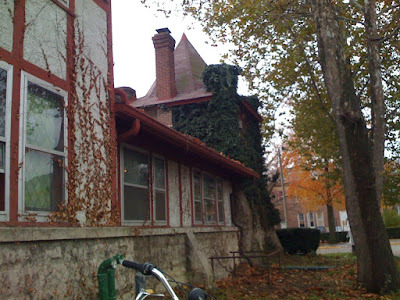 This is a photo of the building that the Red Herring is in. The Anthropology Department is the pink brick building in the background. I usually get my share of lack-luster service at the Urbana bread company, but I suppose I could branch out. M.... Hey...it's Anna Webb (Woessner) Yep... the Red Herring is right around the UU church I went to all through college..... it's way good food. I also saw an improv show there once that was quite good. Mike and I are planning on going to lunch there this weekend because like you I don't want to see the place close. I've been reading your blog for a while now.... love the monkeys and the vegan recipes. My brother is dating (and planning on proposing to at Christmas) a girl who has been vegan for years now..... she even has an asparagus (her favorite vegetable) tattoo on her arm. We went to an all vegan restaurant in Chicago with them last month. It was definitely good, but not something that I'm sure I could ever do for permanent. I currently (since high school) eat only turkey / chicken (no red meat), but I know in the vegan community that makes me just another "meat eater". I would really like to try out other diets, but I'm not much of a cook, and I don't think I could pull off a completely vegetarian diet much less a vegan one. Also... totally unrelated. I'm looking for a personal trainer. I know that Rob has his reservations about working with people because of commitment issues, but I'm just checking to see if he would be interested in working with me (for a fee of course). I've been "running" in the past (up to six miles a day), but recently, I've been a slacker. I'm looking to get back into the swing of things so that I can fit back into my jean (not my "skinny" jeans like you..... just my jeans), but I think I need a little help. I thought I'd check with you before I went with a TOTAL stranger. I'm motivated... I just need someone to tell me what to do. And... I live in Urban (right by Lincoln Square Mall... I have a membership at Cardinal Fitness that is currently not getting much use). Just let me know if Rob (or you) would be interested in helping me get back on track. Good luck with your school work! Anna, its good to hear from you!! I had no idea that we were neighbors. Where do you like to run? I have no personal training qualifications, but I would be happy to run with you anytime. Also, the local running club does a Womens' Beginning Runners group. I'm not sure what their schedule is, but I can look into it and let you know. Its a lot of fun! Hi Mom! Hi Anna! Hi Melissa!